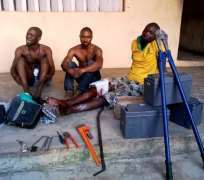 Men of Ogun State Police Command have arrested 3 men for vandalizing the Mast of Telecommunication giant MTN at Ode-Remo in Remo North Local Government of the State. The trio of Balogun Lukman, Sunday Kayode and Atanda Abiodun were arrested on the 27th of April by Police patrol team of Ishara Division led by the DPO CSP Ysusf Taiwo. The suspects who came with a blue coluor Ford bus with Registration No OYO NRK 842 XA were sighted at the Mast around 02:00am with the vandalized parts of the mast, which includes three heavy duty batteries and small cutters. On sighting the Policemen, they all took to their heel but were pursued and arrested by the Policemen while two amongst them escaped. The Commissioner of Police CP Ahmed Iliyasu ordered a full scale investigation into the case.